Delay Says, "In the End We'll Give Earle a Good Texas Whooping!" 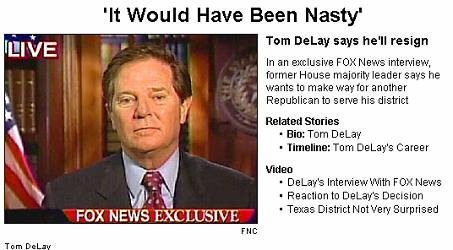 Tom Delay announces he will step aside from his race for re-election today. 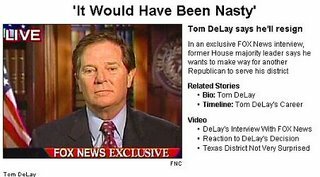 “The Abramoff affair has nothing to do with me,” DeLay said. A formal announcement of DeLay’s plans was expected Tuesday at a news conference in Houston. In a video statement made available to television news networks late Monday, DeLay blamed “liberal Democrats” for making his re-election campaign largely a negative one. President Bush told reporters Tuesday morning that he spoke with DeLay on the way back from throwing the first pitch at Monday’s Cincinnati Reds’ home-opener. Delay: I just realized that my constituents don’t deserve this. They deserve a Republican and I think I could have won this seat, but it would have been nasty. It would have cost a fortune. FOX News: But, you’ve never backed away from a challenge before. That’ why you got the nickname the hammer. Why not face up to this one? Delay: The challenge has always been in the interest of the conservative cause and the Republican majority and I am more interested in growing the Republican my own future. I can still be out there working for the Republican majority for the and the conservative movement and not jeopardize this seat. FOX News: Then why put your district through a Republican primary if you knew you were not going to hang on to your seat? Delay: I didn’t know that at the time. Remember, I didn’t set the deadlines for filing or the deadlines for the primary. We thought that in December when we had to file for office that we would be in trial in Austin and be out of trial because it would only take about three days to beat Ronnie Earle’s frivolous charges. FOX News: Some say the “hammer” has gone soft. Delay: Well, first of all, that is not a name I call myself that is a name given to me by the Washington Post. People who know me know that I am passionate about my party and constituents. I think I’ve been effective and it’s time for me to go do something else. Delay: No the Abramoff scandal has nothing to do with me. The Justice officials say I am not a target in this investigation. What those men did greatly disappointed me but it has nothing to do with me… I know that the Left has used this to try to brand me with guilt by association (read any newspaper in the country), but I have always served I think honorably and ethically. I have never broken the law or the spirit of the law. In fact, I am the most investigated man in Washington and they still have not been able to charge me with anything because there is nothing there. Delay: My liberal democrat opponent has been raising money all across the nation. He’s got Barbara Streisand’s support, George Soros’ support, Nancy Pelosi’s support. He’s got money from Boston, Chicago, Hollywood, very little money from Houston, Texas. His money will dry up. John at Powerline believes the politically-inspired prosecution of DeLay by Travis County’s discredited DA, Ronnie Earle, is a bad joke.